The New York State Teacher Certification Exams (NYSTCE) are the suite of exams you need to pass before you can become qualified to teach in New York. The specific tests you need to take will depend on what grade level and subject you intend to teach. If you plan to teach any subject at the first to sixth grade levels, you will definitely need to take the Multiple Subjects 1-6 exam to demonstrate your command of the core subjects of literacy, arts, math, and sciences at those grade levels. How Much Does the NYSTCE Multiple Subjects 1-6 Test Cost? The total price for the exam is $179. This is true whether you choose to schedule all three for a single session or to schedule separate sessions on different days. Since it is the same price either way, you should definitely consider making multiple appointments, especially if there is a particular section that you are worried about. Taken altogether, the exam lasts more than five hours which can be mentally and physically draining. So if you feel you would perform better completing the exam in two or three sessions with a day or so break between to rest and recharge, you should definitely do that. If, on the other hand, you feel confident in all three subjects and prefer the idea of knocking them all out in one go, schedule all three for the same appointment. What Is the Time Limit for the NYSTCE Multiple Subjects 1-6 Test? If you are seeking to teach at multiple grade levels and, therefore, need to take more than one of the “multiple subject” tests, you can use your arts and sciences score for all of the multiple subjects tests you take. In other words, you only need to take that section once (as long as you receive a passing score). 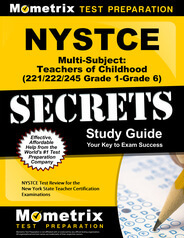 NYSTCE Multiple Subjects 1-6 Flashcards. 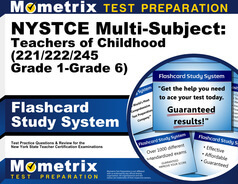 Proven NYSTCE Multiple Subjects 1-6 test flashcards raise your score on the NYSTCE Multiple Subjects 1-6 test. Guaranteed. Each section of the test is scored individually and you need to receive a passing score for each one in order to pass the exam as a whole. Fortunately, if you don’t pass one section, you will be able to retake only that section rather than needing to sit for the entire exam all over again. With that in mind, you need to receive at least a 520 out of a possible 600 on each of the three sections. Do I Need to Study for the NYSTCE Multiple Subjects 1-6 Test? Given the broad scope of this exam, you will definitely need to spend a few weeks preparing for it. In that time, you will want to focus primarily on your weakest subject whether that’s math, science, art, or language arts. You will also want to devote a little of your study time to brushing up on your stronger subjects within the context of this exam. The best way to do that is with study materials that have been designed specifically for this test. The Mometrix Study Guide and Mometrix Flashcards are two great examples of that. They have been created by a team of experts who know this test and know exactly what kind of questions you will be asked. The chapters of the study guide are organized and written accordingly so that you can get a complete and comprehensive overview of everything you will be expected to know. Then, you can reinforce that knowledge by quizzing yourself using the flashcards which perfectly complement the guide. These flashcards are great to toss in your bag and take with you for mini study sessions throughout the day. They are also effective in group study sessions as a way to quiz each other and engage the material in a more interactive way.